*Corresponding author: Anna-Marie Hosking, Department of Dermatology, University of California, Irvine CA. How to cite this article: Hosking A, Margit J, Chloe E, Junxiao Y, Emon H, Jeffrey R, Zhongping C, Mesinkovska N. Improvement in Scalp Dermatomyositis with Platelet-Rich Plasma. Dermatol & Cosmet JOJ. 2018; 1(3): 555562. Dermatomyositis (DM) is an inflammatory myopathy with hallmark cutaneous findings, including heliotrope rash, Gottron’s papules, as well as photodistributed erythema and/or poikiloderma. Scalp DM (SDM) presents as erythematous plaques with overlying scale, associated with severe burning pruritus. Due to inflammation, it may also present with non-scarring alopecia. First-line treatment for SDM includes intralesional corticosteroids; however, to date, no therapy has proven effective. Platelet-rich plasma (PRP) is an emerging treatment modality for a variety of disease entities including arthritis, oral surgery, and skin rejuvenation. Recent reports demonstrate PRP may have a promising role in hair regrowth. Herein, we report a case of refractory SDM with significant clinical improvement after treatment with subdermal PRP injections of the scalp. We also used optical coherence tomography (OCT) as a non-invasive imaging methodology to longitudinally monitor hair growth over the 18-week PRP treatment interval. Dermatomyositis (DM) is a systemic, autoimmune, connective tissue disease characterized by chronic muscle inflammation and weakness associated with characteristic cutaneous findings. The disease predominantly affects females compared to males (2:1) and may be associated with occult malignancy . Scalp dermatomyositis (SDM) is seen in 28-82% of patients with dermatomyositis, and presents with diffuse erythema, scale, and poikiloderma of the scalp, with associated non-scarring alopecia [2,3]. Severe, debilitating, burning pruritus is a common symptom, and can help differentiate SDM from other autoimmune causes of hair loss, including lupus and scleroderma . Treatment options include intralesional triamcinolone, as well as systemic corticosteroids, immunomodulators and immunosuppressants to treat the underlying disease. However, SDM is often treatment-resistant, and the above therapies are limited by efficacy, adverse events, and disease recurrence after treatment cessation. Platelet-rich plasma (PRP) has been used for many years in orthopedics, plastic surgery, and maxillofacial surgery. PRP has recently attracted attention in the field of dermatology for its ability to promote tissue regeneration, wound healing, and potential to stimulate hair growth. PRP consists of the fraction of blood plasma with a higher concentration of platelets (generally two to five-fold higher than baseline) and has been shown to activate human dermal fibroblast proliferation, as well as increase type 1 collagen synthesis [5,6]. Studies have demonstrated an anti-inflammatory effect of PRP, with platelet activation leading to release of inflammatory mediators. Specifically, anti-inflammatory cytokines, such as IL-4 and IL-10, are significantly upregulated in comparison to pro-inflammatory cytokines, such as IL-1β . Herein, we report a case of SDM with significant clinical improvement after treatment with subdermal PRP scalp injections. A 35-year-old, Asian female with a 12-year history of dermatomyositis presents for evaluation of alopecia and scalp dermatitis and pruritus consistent with SDM. For treatment of systemic disease, she has been receiving monthly intravenous immunoglobulin (IVIg) infusions for 11 years, with significant improvement in myalgia and muscle weakness; however, she continues to experience persistent, relapsing alopecia and intractable pruritus with scalp thickening and lichenification. 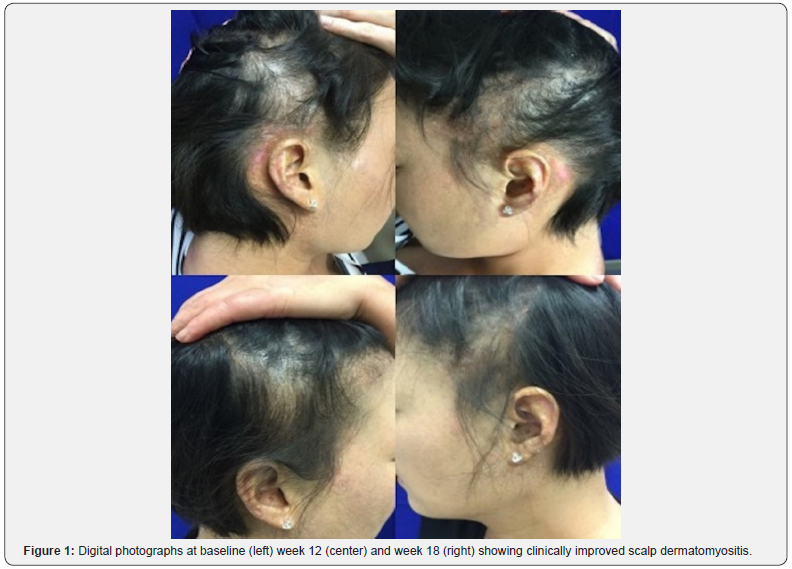 For SDM, the patient was previously treated with intralesional triamcinolone, T/Gel® shampoo, ketoconazole 2% shampoo, topical clobetasol 0.05%, topical calcipotriene 0.005%, topical betamethasone dipropionate 0.064%, and a four-week course of excimer laser, all without significant clinical improvement. The patient’s only current treatment regimen includes monthly intralesional triamcinolone (5mg/mL) injections for the past two years, which have been moderately successful at relieving her symptoms and poorly controlling SDM clinical progression. Physical examination reveals a well-appearing female with Fitzpatrick type 3 skin with scattered, erythematous, thin plaques with scale over the neck and shoulders, violaceous papules over the extensor aspects of the metacarpophalangeal and interphalangeal joints (Gottron papules) with interphalangeal involvement, ragged cuticles, and trace swelling of all digits. The shawl sign is present with erythema and fine papules with scale over the lateral and posterior neck, as well as the décolletage. She also has faint violaceous patches covering the upper eyelids, consistent with a mild helitrope rash. Examination of the scalp demonstrates diffuse hair thinning with patch-like distribution, atrophic erythematous plaques with hyperkeratotic scale and lichenification, and scattered hyper- and hypopigmented atrophic plaques at the temporal and occipital hairlines. Her eyelashes appear normal; however, there is thinning of bilateral, lateral eyebrows. In addition to her intralesional corticosteroid injections, we performed three sessions of subdermal injections of PRP (Eclipse Aesthetics, LLC, The Colony, TX, USA) in the scalp over 18 weeks, with an average of 9mL of PRP injected each session. The PRP sample was obtained after centrifuging 22mL of whole blood and extracting the platelet-rich fraction per company protocol. Three weeks after receiving her first session of PRP, there was significant improvement in epidermal thickness, scale, bogginess, and erythema. The patient reported improvement in pruritus and burning sensation as well as decreased shedding. 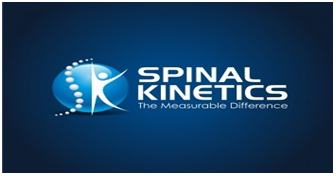 The patient continued her remarkable improvement after the second session of PRP. However, shortly before her third session the patient experienced a mild flare, with increased pruritus and accompanied by systemic fatigue. Six weeks after her last PRP treatment, the patient appeared “much improved” compared to baseline on a Global Impression of Improvement of Alopecia Scale (from “worse” to “very much improved”) as rated by both patient and physician, and reported persistent, but improved, pruritus and scale over the scalp (Figure 1). The patient was subsequently started on oral plaquenil per rheumatology in an effort to better control systemic disease. In addition to the above subjective measures, we also used a novel, non-invasive imaging system called optical coherence tomography (OCT) to quantitatively follow our patient’s clinical progress. OCT uses low-coherence interferometry to measure the back-scatter of broad-bandwidth light, producing sub-surface images of the scalp at a depth of approximately 1300 to 1500μm with a resolution of 10μm . This imaging technique may be used to provide quantitative information on hair follicle density and can be used to longitudinally follow the clinical progress of alopecia patients in the outpatient clinical setting. We used OCT to measure nine different scalp locations, including the frontal hairline, temporal regions, crown and vertex, using a 5mm x 7mm scanning window (Table 1). Although both the investigator and the patient subjectively reported global improvement in hair loss, OCT data was not consistent with these findings. OCT demonstrates increased active hair follicle count on the left parietal (24.5%) with loss in the midline (-9.9%) and on the right (-16.0%). This conflicting data may be consistent with SDM disease course reflecting improvements and flares in disease activity resulting in hair loss in specific scalp areas. Although PRP may improve symptoms of SDM, it does not necessarily induce stable hair regrowth. Involvement of the scalp is a common clinical finding in DM, with one case series reporting scalp involvement in 77.4% patients and alopecia in 87.5% . In the largest histopathologic study of SDM biopsy specimens to date (n=36 specimens from 20 patients), SDM demonstrates interface dermatitis, thickening of the basement membrane, preserved follicular architecture, telangiectasia, and mucin deposition. On horizontal sections, hair counts were most consistent with a diagnosis of chronic telogen effluvium . On trichoscopy, SDM shows enlarged tortuous capillaries, peripilar casts, tufting, and interfollicular scaling. Serologic abnormalities associated with DM include anti-Jo, anti-Ku, and anti-MDA-5 antibodies. The anti-MDA-5 antibody is associated with increased risk of SDM and alopecia . It is possible that in some patients, SDM may be the initial presentation of DM, with the scaly dermatitis often misdiagnosed as sebopsoriasis or seborrheic dermatitis . Systemic treatment of DM often results in a discordance between the response seen in muscle disease and cutaneous disease . Even with remission of muscular disease, cutaneous involvement often persists. Treatment for cutaneous DM may include sun protection, topical or intralesional corticosteroids, topical corticosteroid-sparing agents, such as calcineurininhibitors or retinoid, and/or systemic therapies, such as hydroxychloroquine or low-dose, weekly methotrexate . SDM is particularly challenging to treat and often persists with systemic treatment despite resolution of other cutaneous involvement . Although the mechanism for improvement of SDM’s clinical signs and symptoms with PRP is unknown, the authors feel this topic warrants further investigation. In chronic wound healing, PRP promotes new capillary growth and stimulates epithelization . In orthopedic injuries, PRP has been shown to suppress cytokine release and decrease inflammation, thereby promoting tissue healing [13,14]. We hypothesize that PRP may help attenuate the inflammatory response seen in cutaneous and scalp DM, thus promoting lesion healing. In our experience, autologous PRP injection in the scalp carries little risk with bruising and scalp tenderness being the most commonly reported adverse events. In the literature, rare reports of infection and nerve damage exist, and there is one case of blindness resulting from periocular PRP injections for skin rejuvenation . PRP of the scalp may offer a low-risk complementary or alternative treatment to conventional DM therapy, especially in the case of recalcitrant scalp disease. SDM can be a debilitating manifestation of DM. Often, conventional therapies do not offer patients relief from the clinical signs and symptoms of disease and are accompanied by unwanted adverse events and disease recurrence after treatment cessation. As evidenced by this case, PRP may be a promising treatment modality for SDM by decreasing inflammation in the scalp and providing transient improvement of clinical signs and symptoms of disease; however, the use of PRP may not necessarily result in hair growth in highly inflammatory scalp conditions. Iaccarino L, Ghirardello A, Bettio S, Zen M, Gatto M, et al. (2014) The clinical features, diagnosis and classification of dermatomyositis. J Autoimmun 48-49: 122-127. Jasso-Olivares JC, Tosti A, Miteva M, Domínguez-Cherit J, Díaz-González JM (2017) Clinical and Dermoscopic Features of the Scalp in 31 Patients with Dermatomyositis. Skin Appendage Disord 3(3): 119-124. Kasteler JS, Callen JP (1994) Scalp Involvement in Dermatomyositis: Often Overlooked or Misdiagnosed. JAMA 272(24): 1939-1941. Moghadam-Kia S, Franks AG (2013) Autoimmune Disease and Hair Loss. Dermatol Clin 31(1): 75-91. Kim YE, Choi HC, Lee IC, Yuk DY, Lee H, et al. (2016) 3-Deoxysappanchalcone Promotes Proliferation of Human Hair Follicle Dermal Papilla Cells and Hair Growth in C57BL/6 Mice by Modulating WNT/β-Catenin and STAT Signaling. Biomol Ther 24(6): 572-580. Sclafani AP, McCormick SA (2012) Induction of Dermal Collagenesis, Angiogenesis, and Adipogenesis in Human Skin by Injection of Platelet- Rich Fibrin Matrix. Arch Facial Plast Surg 14(2): 132-136. Bendinelli P, Matteucci E, Dogliotti G, Corsi MM, Banfi G, et al. (2010) Molecular basis of anti-inflammatory action of platelet-rich plasma on human chondrocytes: mechanisms of NF-κB inhibition via HGF. J Cell Physiol 225(3): 757-766. Fujimoto JG, Pitris C, Boppart SA, Brezinski ME (2000) Optical Coherence Tomography: An Emerging Technology for Biomedical Imaging and Optical Biopsy. Neoplasia 2: 9-25. Fiorentino D, Chung L, Zwerner J, Rosen A, Casciola-Rosen L (2011) The mucocutaneous and systemic phenotype of dermatomyositis patients with antibodies to MDA5 (CADM-140): A retrospective study. J Am Acad Dermatol 65(1): 25-34. Callen JP (2000) Dermatomyositis. The Lancet 355: 53-57. Jorizzo JL (2002) Dermatomyositis: Practical Aspects. Arch Dermatol 138(1): 114-116. Tilstra JS, Prevost N, Khera P, English JC (2009) Scalp Dermatomyositis Revisited. Arch Dermatol 145(9): 1062-1063. Andia I, Rubio-Azpeitia E, Maffulli N (2015) Platelet-rich plasma modulates the secretion of inflammatory/angiogenic proteins by inflamed tenocytes. Clin Orthop 473(5): 1624-1634. Kalyam K, Kavoussi SC, Ehrlich M, Teng CC, Chadha N, et al. (2017) Irreversible Blindness Following Periocular Autologous Platelet-Rich Plasma Skin Rejuvenation Treatment. Ophthal Plast Reconstr Surg 33(3S Suppl 1): S12-S16.